When it comes to brows I am quite understated, I do not like overdone brows and to be honest I don’t make a big deal about mine. Partly because I don’t feel like we really get on and also because I just like to keep my eyebrows looking natural. I do fill in my eyebrows but do not have a full on routine as such, I just use a dark brown matte eyeshadow and leave it as that. I know this very much goes against the norm for a lot of beauty bloggers and Instagrammers who seem to be obsessed with eyebrows! When I was sent the Smashbox Ultimate L.A. Brow sticks to review I must admit I wasn’t overly excited as like I said brows are not my thing. I am now however drawn to the understated technique of this product, which is just how I like my brows. I completely agree your eyebrows frame your face and by no means would I say to ignore them, I know when I get my eyebrows threaded it’s like an instant beauty fix and I just feel clean! 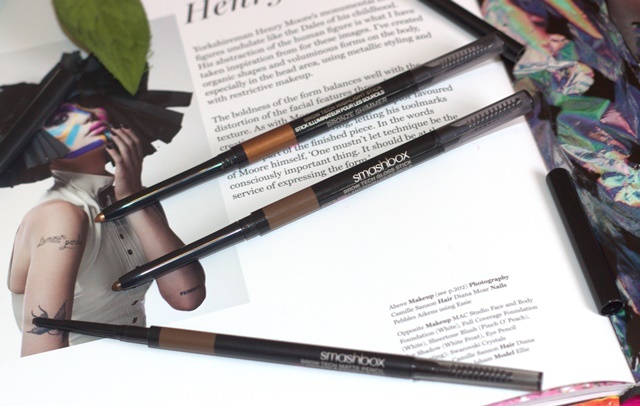 This trio consists of three pencils, all of which come with a spooly (never under-estimate the power of a spooly when it comes to brows!) The Brow Tech Matte Pencil is to define your brows and softly fill in any gaps, if you choose to go for bold brows this will help you to create gentle strokes. This is a quick and easy tool to use and I love it. To add further definition for an evening look just use the Brow Tech Gloss Stick which adds a very soft sheen to your eyebrows which in turn gives your eyebrows a bit of depth, the waxy finish will also hold your eyebrows in place. For extra definition, use the Brow Tech Highlight Stick to define your brow bone, I love the shimmer of these which also make great eyeliners. So interesting, I never knew Smashbox did brow products. The older I get, the lighter my eyebrows get so I’ve gone from barely being aware that they exist to having to collect a wardrobe of brow products.